Follow me on Facebook instead? On the one hand, Hareide really does seem to be very present on Facebook. On the other hand, doesn’t the video seems to say that he ignores voters and supporters in real life? What do you think? 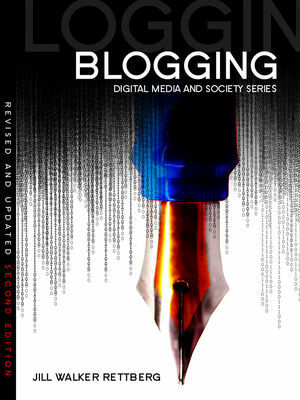 Gunn Enli leads a project at the University of Oslo comparing use of social media in elections, collaborating with, among others, Axel Bruns, who does the same thing in Australia. In an interview with Forskning.no last week Gunn said that one of the main differences between Norwegian and US politicians’ use of social media is that Norwegian politicians invite and participate in debate and dialogue to a far greater extent than the Americans do. Party this is because Norwegian elections don’t depend on donations, so Norwegian politicians don’t have to use social media to solicit donations from their supporters. Erna Solberg, the leader of Høyre and, if the current opposition wins, our next Prime Minister, admitted defeat this morning, though, and wrote that she has blocked private messages on Facebook, and may not answer all questions to her wall either. 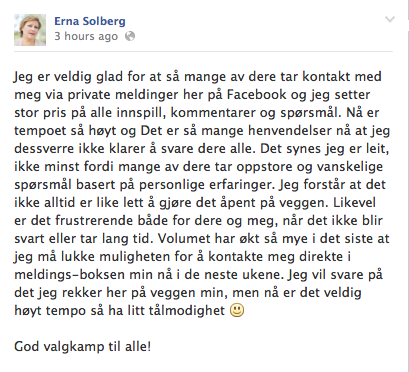 Erna Solberg begs for our understanding: she really appreciates our messages but can’t answer them before the election. Posted to her Facebook page on August 5, 2013 at around 9 am. Solberg (or an assistant?) does answer many of the questions posted to her wall, though, and in the last few days she has answered far more questions than Hareide has. 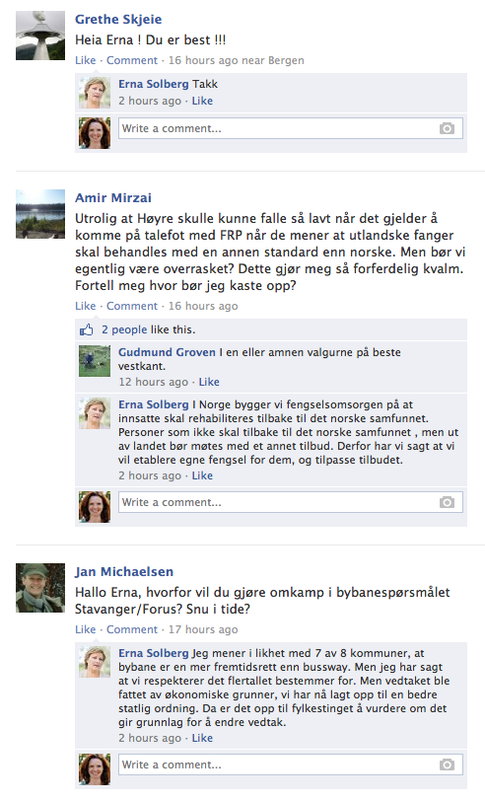 Questions on Erna Solberg’s Facebook wall. The snapshot was taken on August 5, 12pm. Direct democracy and direct communication with voters takes a lot of time – and yet is increasingly important.